A true concentrate of natural active ingredients with immediate effect, this light, non-greasy serum strengthens the structure of the skin and moisturizes it intensely. Firming serum with organic pomegranate reduces wrinkles, firms the skin while activating cell renewal. Non-greasy, this treatment provides a quick and intense hydration to your face, and improves the elasticity and tone of the skin. During the first use, prime the pump by exerting a dozen pressures. Use morning and / or evening on previously cleansed skin. Apply the serum on the face, neck and chest. To penetrate by massaging delicately. 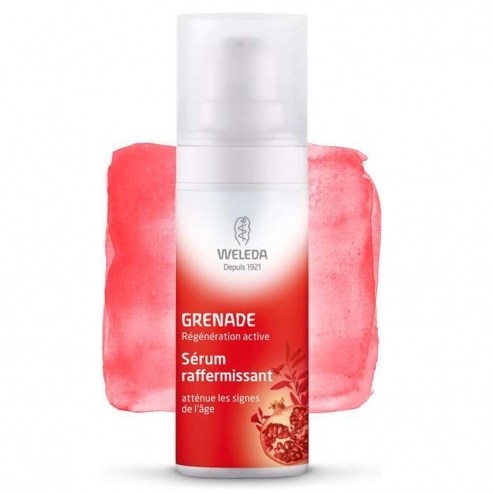 Continue with the application of a Weleda facial. INCI formula: Water (aqua), alcohol, glycerin, aloe barbadensis leaf juice, punica granatum fruit juice, panicum miliaceum (millet) seed extract, prunus spinosa extract wood, xanthan gum, citric acid, fragrance (fragrance), limonene, linalool, geraniol, citral, coumarin. Organic cosmetics: At least 95% of the natural ingredients and / or - where appropriate - processed ingredients of natural origin must come from controlled organic cultivation and / or controlled wild harvesting.